"By eliminating the butter and frying in a NuWave® or SuperWave® Oven we get a recipe the family loves and is practically fat free! Serve with fat-free ranch or blue cheese dressing and more Frank's® for dipping!" Whisk Greek yogurt, egg substitute, and 1 tablespoon plus 1 teaspoon hot sauce in a bowl. Mix panko bread crumbs, paprika, garlic pepper, and cayenne pepper in a separate bowl. Dip chicken strips into yogurt mixture; coat with panko bread crumb mixture. 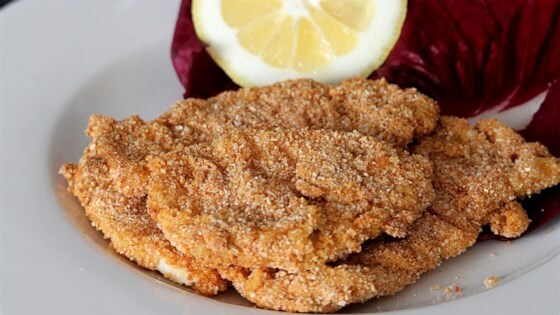 Arrange coated chicken strips in a single layer in an air fryer. Cook until evenly browned, about 8 minutes per side. Substitute egg whites for the egg substitute if preferred. It was very good. Made it as directed. It was crispy and slightly spicy the family loved it. I made this just as directed & it was delicious!! I used 1 large chicken breast & had to cook it a few more minutes but other than that changed nothing. A favorite for sure.